Our standards are anything but standard. Any deck or dock looks good when it’s new. But will it stand the test of time in the Florida heat and rain? After twenty plus years in business we know what works. At Morrison Contractors, our products are designed to last. Our projects actually exceed the building codes. We always take that extra step, use that special fastener, or that oversized lumber. Our docks have heavy duty sub-girder framing with steel thru-bolts. 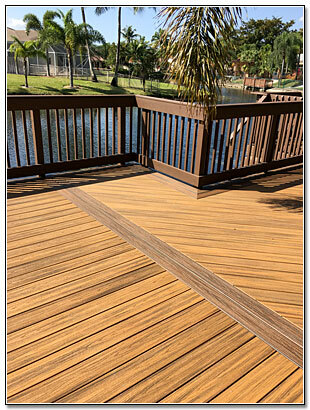 We always screw down every dock and deck to insure that the planks stay in place. We set the standard in marine wood piling trimming using #1 grade strips, PVC protective wrapping, and copper caps. Nobody tops our workmanship. Every cut, every joint, and every board is perfectly fit together before the Morrison name goes on it. It’s a level of craftsmanship not found anywhere else. We treat your family like our family. Morrison Contractors is a true family owned and operated business. We are all working side by side everyday to ensure everything runs smoothly and that our customers receive great service and treatment. Our employees have become an extended family. We have a close bond and a relationship at this company that makes everyone feel personally involved in every project. It’s not just Morrison’s name on the sign it’s the pride and satisfaction that everyone shares at Morrison Contractors when a “Dream Project” is finished and our customer is completely satisfied.